Our own Susan Coleman ran in the Old Louisville 5000 5K race on November 18th, and placed third in her age category! Did you make your resolution? In November, we challenged you to think about ways to get involved in your Old Louisville neighborhood. The challenge included getting involved in your immediate neighborhood association, playing a more active role in the many committees at work or even volunteering to help in the neighborhood events. Now that the new year has arrived, did you decide how you will help make Old Louisville an even more charming neighborhood in which to live? We sure hope you did and we look forward to seeing you at many of the upcoming events! 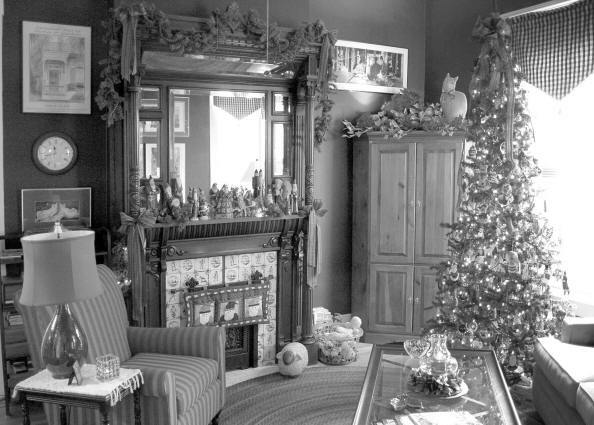 Interior shot of the Laufer home on Garvin Gate taken by john paul during the recent Holiday House tour. I can not thank you enough for the love and support Old Louisville has given me throughout my career. I have enjoyed my years on the police department, but especially the years of service as a District Resource Officer for the Fifth District/Fourth Division. I really got to know most of you in the neighborhood and about your families. In turn, you cared enough to know about me and my family as well. I can honestly say that most of you watched my son Brandon grow from a child into a young man. Outs and of course, “The St. James Court Art show”. I could go on and on with the list of things we have worked on and accomplished together. I treasure each and every memory. Some are of hard times, most are of good times, but the main thing I remember, ALL of us working together for the betterment of a great neighborhood. You accepted me as a family member, not just a city servant and by working together, we got things done! My career would not have been even close to what it was without your love and support and the willingness to accept me as a member of the group! Again, thank you from the bottom of my heart, you are a part of me forever, and for that, I am eternally grateful! In the last few months we have received a string of emails, none really in the form of a letter to the editor, but concerns nonetheless. The topic of these email strings have been crime in the local area. Residents and business owners have noticed an increase in the number of questionable characters in the neighborhood. Drug traffic seems to have increased on many of the street corners. Empty liquor packages abound in the neighborhood, too. In order to make your views known, please join your neighbors on January 15th at the Old Louisville Information Center in Central Park for the Crime and Safety committee meeting at 7:00 pm. This committee work is important to the neighborhood and your presence there can and will make a different in the quality of life here in Old Louisville. Please make plans to join your neighbors on Monday, January 15th at 7:00 pm at the Old Louisville Information Center! First off, I would like to thank you for your hard work in putting together such an informative newsletter for the residents of Old Louisville. It is a great way for members of the various neighborhood organizations to keep abreast of what is going on in the community. It is also a useful tool for keeping a finger on the pulse of the neighborhood. Especially as it appears that the heart rate in Old Louisville has skipped a beat or two in the last several months after recent talk of voting out package liquor sales here. My partner and I recently acquired property near the corner of First and Oak, and I would like to commend those who have initiated this invaluable discussion. The sales of package liquors in our neighborhood is a blight on the community, and it is appalling to see how little people have done to address this issue in the past. We are long overdue for a solution. It is time for respectable residents of the neighborhood to band together and fight those who do not care about this neighborhood. Count us in! Lastly: this is for those who supposedly organized recent meetings for people to discuss the issues. How come so many of us did not know about these supposed meetings? From what I have heard, the only meetings that were held were those organized by businesses affected by this vote, and it was nothing more than a strategy for them to fight ‘the opposition’. What little notice that was given about the meetings was only one or two days in advance, too. P.S. I have heard that both sides of the argument met recently with Mr. Unseld and have come up with a compromise to avoid sending this issue to the electorate. As long as it gets rids of a fraction of the problems along Oak Street, we are for it. As a resident of the 1100 block of S. 3rd St., I would like to voice my support for a moist or dry vote in our precinct. After years of obvious neglect by our city government, now it appears that the different businesses along Oak Street are neglecting their duties to their neighbors just so they can make money off the unfortunate people who patronize them for cheap package alcohol sales. For years they have been warned about the problems they are causing, and for years they have ignored us. Not it is time to pay the Pied Piper, I am afraid. I live on Fourth Street, and I don’t know if it’s too late, but I would like to give my opinion concerning the recent discussions I have witnessed about the proposal of a vote to make this area free of package liquor sales. From my point of view, this is a very good idea, and I will tell you why. 1) Nothing is happening in this neighborhood to make it a better place to live. Yes, people are telling me it is going to get better down here, but I do not see it happening, and I think voting out liquor sales might be the way to do it. It’s obvious that things haven’t been working in the past. Too bad. 2) Something needs to be done about the ‘establishments’ that specialize in the sales of single carryout drinks along Oak Street. Every time I go into Riteaid, I notice that most of the people in there are buying only one can of beer, and we know what there are going to do with it. They are not going to wait to get home to drink it. These people cause many of the problems along Oak. If you drive along Oak at anytime of day, you will see that there are many people walking along with brown paper bags with bottles in them How nice! It really makes our neighborhood a classy place, doesn’t it? Let’s get these people out of the neighborhood! And now! One final observation I would like to make is that there is another place that doesn’t sell alcohol, but that is still contributing to the problems down here. It is the ONE FORCE STAFFING employment agency at the corner of Oak and Fourth Streets. The man who runs it busses people in from all over the city and the ones who do not get jobs have to wait till the end of the day before they get the bus back home. What do they do while they wait? They walk up and down Oak and get in trouble! Thank you so much for informing me about the recent issues concerning the proposed wet-dry ordinance on the books in our fair neighborhood. As a lifelong resident of Old Louisville, I am pleased to see that people on all sides of the issue are concerned enough about the issue to get involved. After seeing the effects of package liquor sales on the Oak Street area, I have to - unfortunately - chime in on the side of those in favor of a totally dry vote. It is has been said that “things are improving in our neighborhood,” but, I really have to disagree. At no time in the history of my residence in this area have I ever seen so many homeless people on the streets. Homeless people aren’t necessarily the problem, however, many of them get into trouble when they get their hands on a cheap drink. And alas, there are all too many establishments on Oak Street who are happy to provide this cheap drink at our expense. These places (like RiteAid and others) do not care at all that they are contributing to the problems in our neighborhood. All they care about is making some money, and as long as they get a pay check, they don’t care about the effect their liquor sales have in the area. I know that the sale of alcohol itself is not the problem, however, someone has to start taking responsibility for these problems, and if these places are going to make money off the situation, then they need to step up to plate. If they don’t care about our neighborhood, then I really don’t care about them. Sad to say, but it’s true. Maybe it’s just time to clean house and get rid of all the places that sell alcohol in our neighborhood. People say that this will make the neighborhood worse, but I don’t agree with that. I really don’t see the problems along Oak Street getting any worse. We have drug deals going on, and there is prostitution, public intoxication, assaults, robbery and vagrancy as well. Not to mention the fact that it is an eye sore! When are people going to wake up and realize that things will not get better until we do something about it ourselves? It’s obvious that the city doesn’t give a rat’s *ss about us here in Old Louisville, so we’re left to our own devices, as we usually are. The people who keep saying that wonderful things are going to happen soon for our neighborhood haven’t delivered yet, and they have to realize that many of us are running out of patience! We need to do something now, and I think that starting with a wet-dry vote would be a perfect way for us to exercise our democratic rights as citizens of this country. Let the people decide! I would like to take the opportunity to thank you for another wonderful holiday house tour in Old Louisville. My wife and I have done every tour for the last 11 years, and we especially enjoyed this year’s tour of the wonderful Victorian homes in the neighborhood. The brochure was very attractive and informative, and I thought it was an excellent idea to include the three Bed and Breakfast inns. It really added an extra something to the tour. Alfred Dupont at the Dupont Mansion was a riot! We also loved the wonderful gourmet tea at the Inn at Central Park, and the ghost stories at the Central Park B&B. All the homeowners were very gracious to have us inside their lovely residences, and the gift shop was nice as well. I would especially like to thank the shuttle drivers who were very informative and helpful. Once again, thank you for the best house tour yet. We hope it was your most successful, and look forward to next year’s tour. It is an annual tradition for us now and we wouldn’t miss it for anything. Thanks for your encouragement and support. We look forward to seeing you there. Lunch and Dinner, open 7 days. We have a new lounge for relaxing, a refurbished and larger bar, multiple giant TV’s, a private dining room and great food. You’ll also like our selections from local artists on the dining room walls and gallery at the rear. P.S. Keep watching the brick wall facing the patio on the West side of the building as a wonderful mural emerges over the next month or so. The artist doing this is very good and you will like the result. We are currently in the permitting process with Landmarks with this and the mural concept has been approved by staff. Mayor Jerry Abramson wants you to be a part of building a more efficient government and a stronger community – which is why he has scheduled The Mayor’s Community Conversations. The Community Conversations are your opportunity to go one-on-one with the Mayor about issues of immediate concern or your thoughts for the future of Louisville Metro. You may have a problem in your neighborhood or want to discuss a project of interest community-wide. You can ask a question or share an idea. It’s up to you. Mayor Abramson and representatives from all government departments will be available to answer questions about neighborhood or community-wide issues and questions. Community Conversations are a real opportunity to have your voice heard – and your needs met. Your Metro Councilmember will also be available at the Mayor’s Community Conversations. Come to discuss your ideas with your council representative or get to know a council member from another area of the community. Promptly at 6:30 p.m., Mayor Abramson opens the program and makes general announcements. He then introduces all of the Louisville Metro Department Directors and explains their areas of responsibility. Citizens are then encouraged to get in line to speak with the Mayor or the department director of their choice. This format allows for one-on-one conversations as opposed to a “town hall” format where everyone in the audience has to listen to others concerns before they can voice theirs. Louisville Metro employees dressed in easily identified blue shirts are available to help guide residents to the proper department director for their concerns. MetroCall 311 Information Specialists attend each Mayor’s Community Conversations. Since Mayor Abramson wants all concerns and questions to receive a timely response, all issues are quickly logged into the MetroCall system – where they can be tracked for performance. You may want to attend by yourself or with your family. Scout troops, neighborhood associations, church groups or school groups are always welcome. You do not have to have a complaint or concern to attend the Mayor’s Community Conversations. This is a wonderful opportunity to see “democracy in action” and learn more about how your community operates. Many scout troops attend while they are working on badge projects and other groups come with a camera to capture their group in action for their newsletters. By Phone - Can’t attend a Community Conversation? You can join in the conversation anytime by calling MetroCall 311or 574-5000. MetroCall is the only number for Metro Government that you need to remember. Customer service representatives will listen to your concern and enter it into the computer system. On Line - You can also let us know your comments, concerns or complaints on line at metrocall@louisvilleky.gov. You can also connect online with Louisville Metro Government in many other ways – by visiting our website, www.louisvilleky.gov/metrocall. Should you require special accommodations to attend Community Conversations, please call MetroCall 311 or 574-5000. Community Conversations will be held the third Monday of each month* at 6:30 p.m.
(*The 2007 January and Mayor’s Community Conversations will be held on the third Tuesday due to the Martin Luther King, Jr. holiday. There will be no Mayor’s Community Conversation in December.) They will rotate among different neighborhoods. Choose the location that’s nearest to you or do as Mayor Abramson has asked and “break out of your comfort zone” to join a Community Conversation in another part of town. For a list of dates and locations call MetroCall 311 or 574-5000 or visit www.louisvilleky.gov. Decorative hardware, plumbing, and lighting supplier Signature Hardware has announced the opening of its new designer showroom and warehouse facility at 2700 Crescent Springs Pike in Erlanger. The 3,000 square foot showroom is divided into two levels, and offers a sampling of Signature Hardware’s plumbing, hardware, and lighting products available for sale. Clawfoot tubs, vanity cabinets, thermostatic showers, specialty shower rods and rings, floor registers, and decorative door hardware are just some of the items on display. Visitors are invited to tour the showroom, browse through the company catalog, and meet with a knowledgeable sales associate to purchase fixtures for their home improvement projects. Conveniently located near Buttermilk Pike on I-75, the showroom is open Monday through Saturday from 8:30 am to 5:00 pm.